Pushed by a strong front moving across the Southeast tropical storm Cristobal made a turn toward the north earlier today, over the southeastern Bahamas. The new forecast track for Cristobal will keep the cyclone farther away from the U.S.A. coastline than initially estimated taking it closer to Bermuda. Despite its interaction with the front tropical storm Cristobal will encounter conditions favoring further strengthening in the next couple of days as it begins to gradually turn toward the north-northeast and eventually the northeast, so there is a possibility that Cristobal may reach hurricane strength after all. While the forecast track may keep Cristobal away from the U.S.A. mainland, all interest in Florida and the Atlantic seaboard must remain alert and be prepared for potential impacts along the coastal region. There is additional potential for cyclonic activity over the Atlantic basin as we look eastward to a couple of tropical waves now riding ‘hurricane alley’, which we should monitor over the next few days. Slow as the 2014 Atlantic hurricane season has been so far, and may continue to be, it is critically important to keep in mind that all it takes is one hit by a hurricane, regardless of its ultimate intensity, to inflict plenty of damage, possible death and injury, and human suffering. Pay attention, be prepared! MITIGATE! 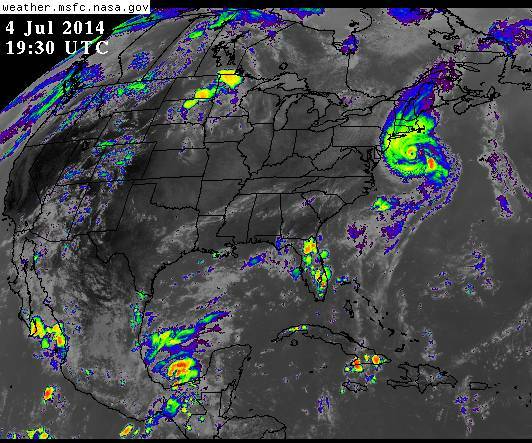 HURRICANE ARTHUR IS NUMBER ONE! It started as a system of low pressure off the coast of Georgia and Northern Florida just a few days ago. This disturbance then started tracking SSE slowly veering south and then southwest aiming for central and southern Florida while generating plenty of rain and thunderstorms over most of Florida. 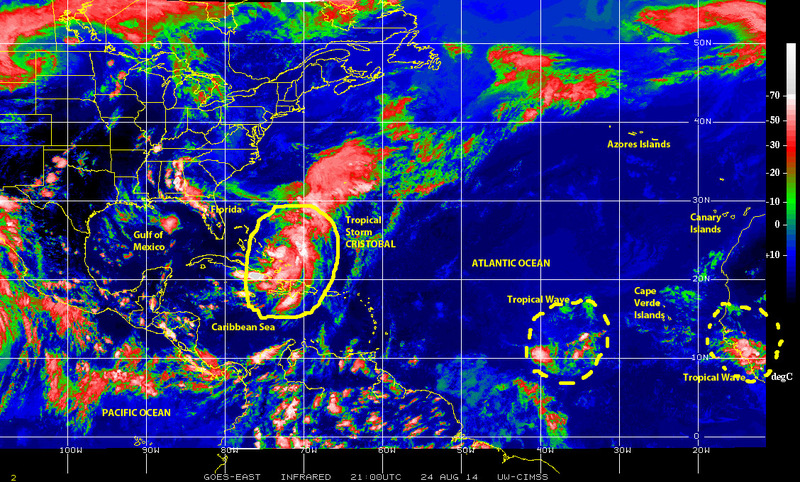 The system became a tropical depression as it did a 180 and began tracking northward as it reached tropical storm strength, to eventually become Hurricane ARTHUR, the first hurricane of the 2014 Atlantic Hurricane Season. While we have had some cyclonic activity generated in this region in recent years I can’t recall a hurricane forming where this one did, but I haven’t gone back to check the historical record going back to 1851. I will do so and report back. All interests along the USA Atlantic seaboard all the way up to the northeastern USA, including those area still undergoing post-Sandy recovery work, need to be alert and prepared, and monitor this one closely. 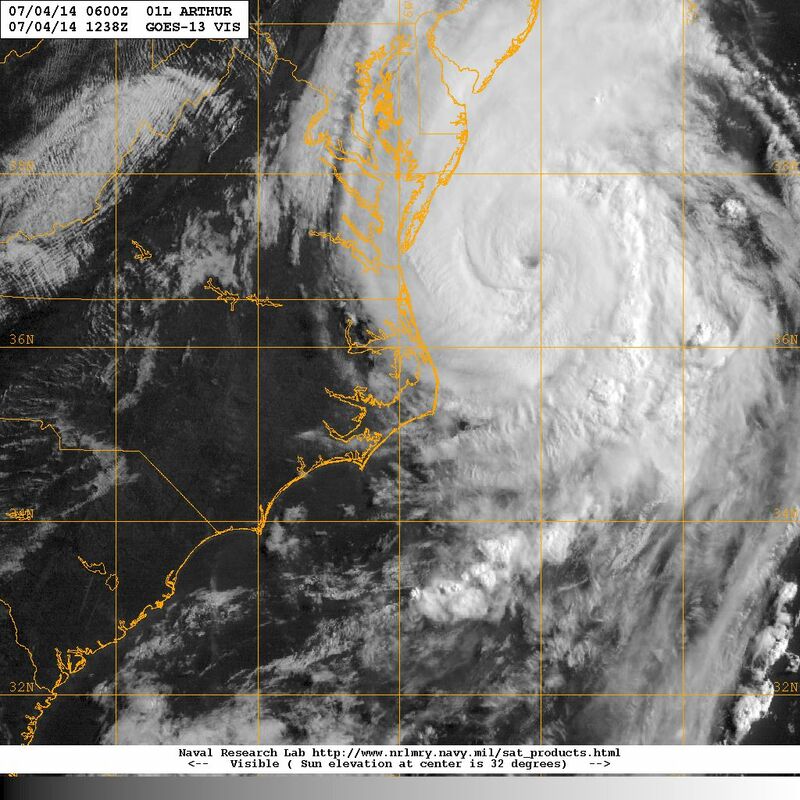 Hurricane ARTHUR still a category 1 tropical cyclone is some 240 km east of Long Island, NY tracking NE at a rather quick 40 kph (24 mph). Because of its rotation storm surge should no create too much of a hazard for the coastal regions of NY and NJ, and beyond. The forecast calls for most of rain impact to be over the Canadian provinces.